Can I Succeed At Beachbody Coaching If I Live In A Small Town? “I want to become a Beachbody Coach, but I don’t think I’ll be able to be successful because I live in a “small town”. When signing up to become a Beachbody Coach does location matter? Lets use a gym as another example. A gym can only have members that live nearby in the local area. People aren’t going to join a gym that is a hour from their home. If you own a gym, your business growth is limited by your location. Don’t let your location be an excuse for not succeeding or for not even getting started. Instead of looking for reasons why you can’t succeed, make a list of reasons why you WILL succeed. I live in what many people would consider a “small town”. (Holly, MI – Population 6,086) And my Beachbody business results wouldn’t be any different if I lived in New York City, or Alaska. Below is a great example and proof that location is irrelevant. 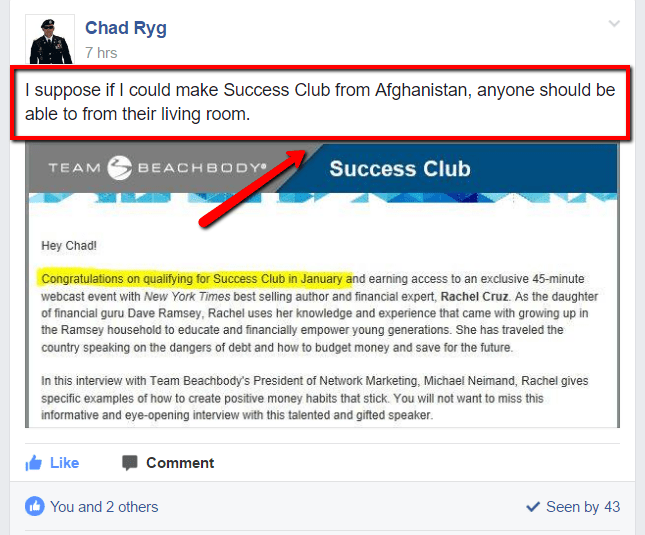 Fellow Beachbody Coach Chad had a successful month with his business while on military deployment in Afghanistan. Chad’s results are amazing! He easily could of said, “I’m in Afghanistan, I’m not doing this Beachbody “stuff” right now.” But Chad still put in the work. Which now that I think about it, is very impressive. The point is, nowadays with the internet, social media, email, etc., the entire world is just a few clicks away. Your success as a Beachbody Coach is not determined by your location and you actually have a benefits over traditional storefront businesses because you are able to serve anyone anywhere. My only disclaimer is, having access to the internet is a MUST. Obviously ff you’re in a remote area with no electricity, no internet connection, and no one around you, then you’re right, that will make building your Beachbody business a challenge. SEE ALSO: Make Money With Beachbody On Demand!